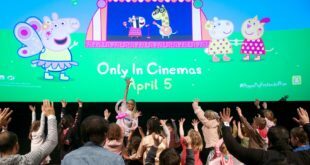 Alton Towers Resort has revealed details of further rides, attraction and licensed characters to feature in its hotly anticipated CBeebies Land. The new area will feature characters and shows from the pre-school channel, including Something Special, Tree Fu Tom and Mr Bloom’s Nursery. The new additions will join the recently announced In the Night Garden Magical Boat ride, an experience featuring Igglepiggle, Upsy Daisy and Makka Pakka. CBeebies fans will be giving the chance to meet The Veggies in Mr Bloom’s Allotment, learn about the five senses in Nina’s Science Lab, visit Postman Pat’s Parcel Post, get active in Tree Fu Tom’s Training Camp, drive a Numtum Cart in the Numtum’s Number Go Round and visit the world of Charlie and Lola’s Moonsquirters and Greendrops. The attraction – opening on May 24th this year – will also feature The Big Fun show Time pavilion, hosting live experiences including shows from Mike the Knight, The ZingZillas and Nina and the Neurons.